Cocoa Butter (also known as cacao butter) is the natural cream colored vegetable fat extracted from cocoa beans during the process of separating the powder and liquor from the bean. After being extracted from the cacao bean, the cocoa butter is ultra refined and deodorized to reduce the strong natural chocolate aroma and color. This results in cocoa butter with a no scent than natural refined cocoa butter. This refined butter is obtained from the fruit of the Cocoa tree. From its beans, the butter is extracted and further processed and refined to obtain a white, scent-free butter. It has been used to heal and moisturize skin that has been exposed to the elements. It also helps reduce the formation of stretch marks during pregnancy by keeping the skin supple. It makes a wonderful ingredient in lotion bars, lip balms, body butters and soaps. Cocoa Butter is one of the most stable fats known and it contains natural antioxidants that prevent rancidity. This butter is very hard in consistency. Cocoa butter is known for its high oxidative stability as a result of it being naturally rich in antioxidants and vitamin E. With a typical melting point ranging from 88-95 degrees Fahrenheit, ultra refined and deodorized cocoa butter is a stiff solid at room temperature. From a cosmetic and skin care application standpoint, deodorized cocoa butter is used for its natural emollient properties and to bring stiffness to the end product. Because the material is ultra refined and deodorized there should be less interference with the desired fragrance of a finished creation. 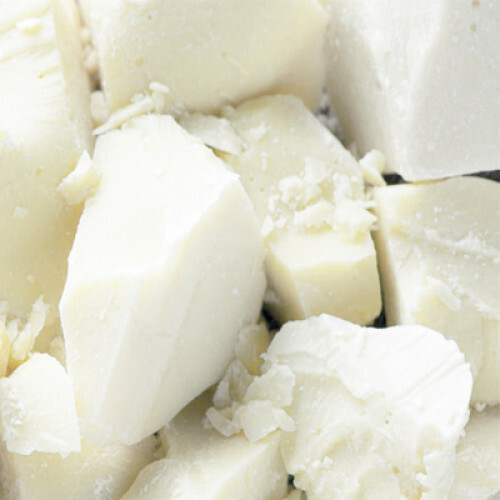 If the formulation calls for a refined, bleached and deodorized cocoa butter without any aroma at all, the white cocoa butter offered by Botanic Planet is a great alternative.